The perfect case for emergency response personel in a challenging environment, the Pelican Case for the Powerheart G5 will protect your unit from the harshest of climates. The hard casing and foam interior of the Pelican Case will prevent damage from knocks and bumps. 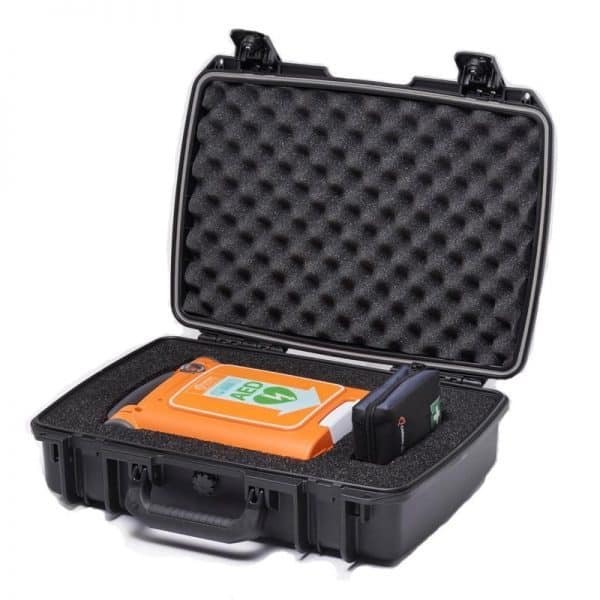 With additional storage room for first aid equipment and two keys provided to allow the case to be secured, the Pelican Case is the only protection for your defibrillator that you need! Sudden cardiac arrest can strike at any time in any place. It is the leading killer of Australians and impacts 15,000-20,000 people per year. The cause of sudden cardiac arrest is the reason that access to intervention equipment is highly effective in improving survival rates. Sudden cardiac arrest is the result of an abnormality in heart rhythm (arrhythmia), caused by the malfunctioning of the heart’s electrical system. The heart has its own electrical stimulator, separate from the other muscles in the body, that is located in the upper right chamber of the heart and provides electrical impulses that flow through your heart to generate your heart rate and allow the heart to beat and pump blood around the body. When this electrical stimulator fails or misfires, the heart may beat too slow, too fast or irregularly, which can cause the heart to stop functioning (sudden cardiac arrest). Symptoms include: – Sudden collapse – Loss of consciousness – No breathing normally – No sign of life This failure of the heart to function normally is caused by coronary heart disease in 80% of people and in these cases, is precipitated by poor health and warning signs such as high cholesterol and blood pressure. However, sudden cardiac arrest can also be caused by variables such as electric shock, drug use or sudden trauma to the chest. The defibrillator is able to provide electrical pulses to the heart which can shock it back into normal rhythm and get the blood moving back around the body. Lack of oxygen to the brain can cause irreversible brain damage within 4-6 minutes of collapse, with further terminal damage to the rest of the body following shortly after. Even with access to external medical care (paramedics), without defibrillation there is very little chance of victim survival (between 2%-5%). In work environments where there may be stress to the body and lack of access to immediate medical support, a defibrillator is essential. The Pelican Case, Powerheart G5 will allow you or you staff to carry your unit with you easily and protect it from damage, so that it is ready to use if needed. The hard casing and foam interior will prevent damage from knocks and bumps. Being water resistant, this case is handy for those who work on the water. The Pelican Case is the essential accessory for a defibrillator that will be used in harsh environments and needs to be durable so that you and your staff can have the peace of mind that you will be ready for action in the case of a sudden cardiac arrest.